Here are a few things to consider before you decide to handle rust removal on your own. These basic steps give you an idea what's involved in repairing a hole created by rust. Do more research before you take on a rust removal project. First, use a grinding tool to remove all traces of the rust. The grinder can be rented, and may function as a polisher, too. Otherwise, you can equip your drill with a grinding disc. This, however, is the slow way to do it. Grind down to bare metal in an area up to 3 inches around the hole. Remember, if any rust is left at all, it will spread rapidly, making your work pointless. So be thorough. Bevel the edges of the hole. Clean away any dust, grease or other matter. Then you'll have to fill the hole. This can be accomplished in several ways and there are different schools of thought on which method is the best. A flexible fiberglass or aluminum screen cut to size and held in place by dabs of body filler is a popular option. This same screen can also be riveted in place from the opposite side of the panel for more strength. Of course, these rivets will then need to be ground and blended in with filler. Smaller holes can be covered with a special kind of tape designed specifically for this purpose. With the hole filled, use a mixture of body filler and hardener (prepared as indicated on the product packaging) to build the area up just "higher" than the surface of the panel. Use a spreader and work the material outward from the centre of the area, following contours. Spreading and shaping tools are available where you purchase your filler. Then sand and "feather" the area, working from coarse to fine paper. 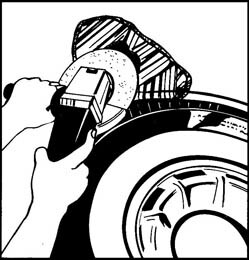 A sanding disc attached to the grinder or a drill can be used to start, then a sanding block with successively finer grit papers should follow. If the area is not completely smooth, you must continue to sand, add filler, and re-sand until it is. Then you're ready to paint. Mask off areas that should not get painted. Then spray the area with a primer coat. Follow that with a block sanding using 220-grit paper followed by 320-grit. Since this is a spot finish, you can use an aerosol spray can. For larger jobs such as a panel or entire car, rent a sprayer and compressor. Matching the paint is a tricky aspect. Start with your car's paint code, which is likely listed under the hood or on the door post. The type of paint used will be helpful information, as well. Then check with an automotive paint supplier. Aerosol spray application for a small area is quite simple. Shake the can well. Hold it 8 to 12 inches from the surface. Spray with smooth strokes, moving your arm across the area instead of rotating the can which will result in paint build-up that sags and runs. Thin coats applied about 30 seconds apart work best. When a coat appears glossy, you're finished. Let the paint dry completely (as noted on can) and then use a rubbing compound to blend the new paint into the old. Follow the compound's directions carefully. As a final step, you can use your rented grinder with a polishing pad for a fantastic shine.